Defamation Per Se: When Libel or Slander Is So Bad, Do You Need Evidence of Damages Before Punitive Damages Can Be Awarded? Florida, along with the majority of states in this country, recognizes that there are some situations where the libel (a written communication) or slander (a spoken communication) is so bad, so obvious in how it hurts and harms someone, that the injured person need not provide as much evidence, or proof, of injury as other, less blatant situations might require. In these cases, the statements rise to the definition of “defamatory per se,” and Florida has recognized these special kinds of slander and libel cases since 1887. In that year, the Florida Supreme Court found that defamation per se statements are so powerful in their ability to hurt someone that Florida would deem them to be presumed harmful as a matter of law. (See Montgomery v. Knox, 23 Fla. 595, 3 So. 211, 217 (1887).) 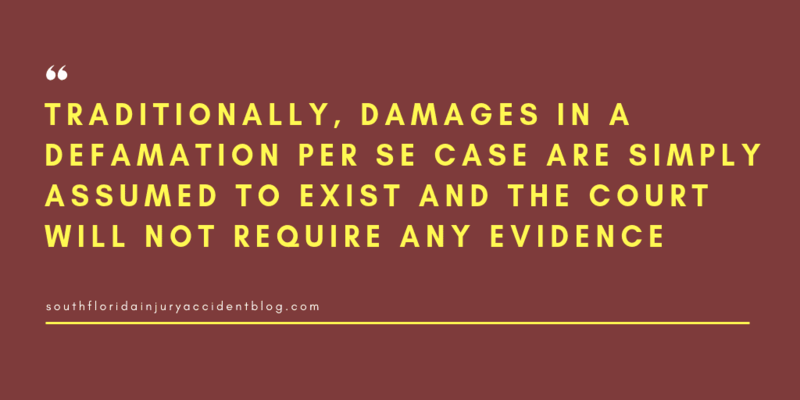 In a defamation per se case, the judge will allow damages to be awarded in these cases even if no evidence of harm has been presented. What is Defamation Per Se? Falsely state a person has been involved in some kind of criminal activity. Does Florida Law Have Special Evidence Requirements For Defamation Per Se Cases? As noted above, Florida law has singled out defamation per se cases for special treatment. To recover damages, there’s no need for the plaintiff to prove harm on the part of the defendant (who spoke or wrote the words) in order to be compensated for the wrongful communication (however, when a victim is seeking punitive damages things are different – see below). The good news is that “[T]he law presumes malice in their utterance,” Abraham v. Baldwin, 52 Fla. 151, 42 So. 591, 592 (1906), where the words are “… of such common notoriety established by the general consent of men, that the courts must of necessity take judicial notice of its harmful effect.” Layne v. Tribune Co., 108 Fla. 177, 146 So. 234, 236 (1933). The purpose of punitive damages is to deter the recurrence of certain behavior and to prevent other similar behavior. In Florida, punitive damages are available to a plaintiff who can prove the defendant was guilty of malice with regard to the defamatory communications (written or oral). Generally, malice can be defined as reckless or careless indifference to a victim’s rights and feelings and can be based on spite, vengeance or bad motives. Again, the good news here is a victim does not have to provide invoices, evidence of lost profits, lost money, to a judge or jury before a punitive damages award can be granted to a plaintiff. – Lawnwood Medical Center Inc. v. Sadow, 43 So. 3d 710, 729 (Fla. 4th DCA 2010). The personal interest in one’s own good name and reputation surpasses economics, business practices or money. It is a fundamental part of personhood, of individual standing and one’s sense of worth. In short, the wrongdoing underlying the punitive damages in this case has Florida law’s most severe condemnation, its highest blameworthiness, its most deserving culpability. For slander per se, reprehensibility is at its highest. Can Punitive Damages Be Awarded For Defamation If An Employer Bad-Mouths An Employee Who Has Quit their Job? In the case of Knepper v. Genstar Corp., 537 So. 2d 619 (Fla. Dist. Ct. App. 1988), R.O. Knepper and David Knepper were plaintiffs who sued for defamation of character damages based upon statements made by people who worked for one of three companies (Genstar, Nitrochem, and Nitrochem Energy) as either their agents or outright employees. These workers had allegedly bad mouthed the two men to their employer and the lawsuit was based upon allegations of defamation of character based upon slander. R.O. Knepper and David Knepper were father and son. R.O. Knepper had worked in the explosives industry for over 25 years. His job experience included selling explosives and using them on-site. Over those 25+ years, he had built up quite a following and had a big client list. His son, David, had followed in his footsteps working with him in selling and operating explosives. For many years, R.O. Knepper worked for Atlas Powder Company. However, when a new company came to town, Nitrochem, he decided to switch employers. Both Mr. Knepper and his son David went to work for the new company, Nitrochem. Father and son worked there for a year and a half. Then they quit. They went back to Atlas Powder Company. This hurt Nitrochem; its business suffered a lot. Soon, there were conversations between executives at Nitrochem and executives at Atlas Powder. Suddenly, Atlas Powder people were hearing bad things about the Kneppers — statements were made to them that R.O. Knepper and his son David had vandalized equipment at Nitrochem. Word got back to the Kneppers about what was being said — that they were vandals — and they filed a lawsuit. No settlement was reached, and the case went to the jury. Father and son won. The jury came back in favor of the Kneppers: both father and son were awarded significant punitive damages to be paid by Nitrochem and related entities Genstar and Nitrochem Energy. Malice was found on the part of the Nitrochem folk talking about the Kneppers to the Atlas Powder folk. Hundreds of thousands of dollars were awarded to the two men by the jury. It didn’t end there, however. The companies appealed, and the appeals court granted a new trial on the defamation damages, finding that during the trial there had been “… an inappropriate positive image of the Kneppers and an equally inappropriate negative image of the defendants.” The appeals court also ruled that the statements made between the employees of Atlas Power and Nitrochem were not protected by privilege as a matter of law, and returned the case to the trial court with directions on how the jury should be instructed. At this point, the parties were left to either expend time and money going through a second trial process or negotiating a resolution at the settlement table. A good piece of advice if you have been harmed by a defamatory communication and you think it rises to a defamation per se claim, is to speak with an experienced personal injury lawyer to learn about some of the issues that can arise with these claims, including the type of evidence needed to prove a claim and the type and amount of damages you can recover. Most personal injury lawyers, like Alan Sackrin, will offer a free initial consultation (over the phone or in person) to answer your questions. How Do You Recover Emotional Distress Damages in Florida? Your outline is informative and quite clear – Thank you. I wonder if there are any particular legal, procedural, or outcome/judgment idiosyncrasies in Pinellas County? Please call in regards to ….